ave a plan. And make sure it employs connectivity between you, your land and your animals. Otherwise, you have compartmentalized divisions that never really “speak” to each other. I could go over all the connectivity on our farmstead but it really is too much for one post, so I’ll concentrate on the my tasks yesterday in the greenhouse and how I played the Kevin Bacon game on the farm. Too often we just think of the chore at hand and forget how each action we take has a reaction somewhere else. In the symbiotic circle of a biological farm its hard to know where to start with an explanation or even a starting point. So you just have to jump in and start somewhere, because in reality it is a continuous cycle that is an ongoing, changing phenomenon. Where most of us fall down is connecting the dots. We want eggs or meat so we get chickens to fill that purpose, and we want vegetables, so we buy seeds and work up some soil and plant them. We have the garden over here, and the chickens off over there somewhere…and the only time we think of eggs and vegetables is when it’s breakfast time and the egg basket is overflowing the spinach bed looks like a shaggy mess – then the light bulb comes on! We can make a frittata! I want you to take it several steps further and really connect the parts into a whole. I think to the casual observer these beds look like a mess. And they are, but what I see is greens for the chickens, layers and meat chicks. Granted it would a symbolic symbiotic effort to leave the weeds as mulch and if I didn’t keep stock that would be a good use for them. 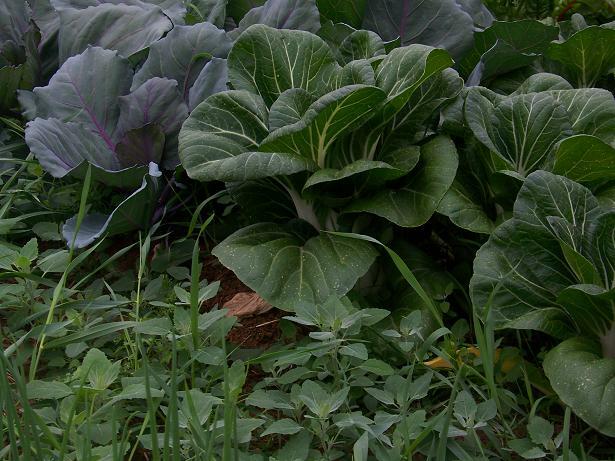 But I do keep chickens for eggs and meat and because I confine my hens, I need to step up and bring them greens daily. 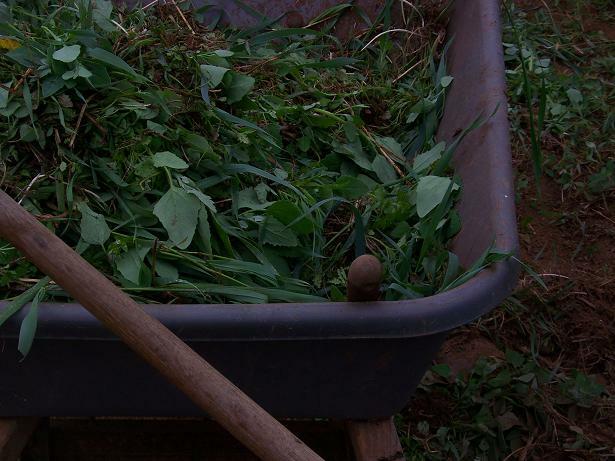 There is a reason weeds have common names like Fat Hen and Chickweed… . Besides all our household scraps, the hens get daily vegetables. In the winter it may be roots and chickweed and in the summer they get overloaded with all the various garden trimmings that are deemed to blemished for the kitchen, not to mention all the coffee grounds and eggshells they can stand. Headed to the chicken greenhouses. All weeded and ready for the next round. Whaaa… . Look at those stupid Cornish Cross! They are eating weeds! Russell Crow and his lady friends. The hens get their share too, only after Russell inspects their food for them. 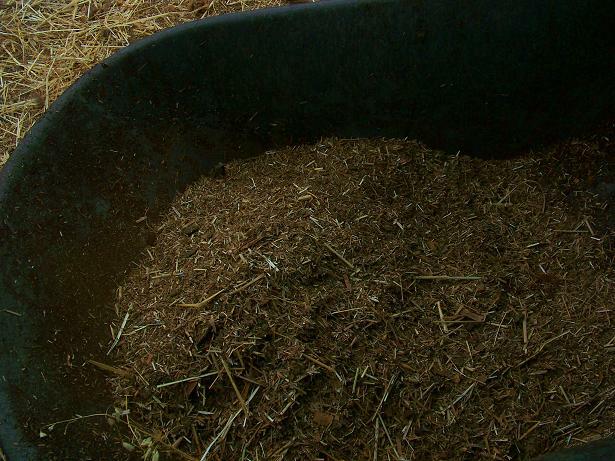 The method behind all my madness is the hen scratched chicken bedding/manure mix. I needed some for amending some new garden beds and the chickens were happy to trade for the greens. Chickens, not just for eggs! 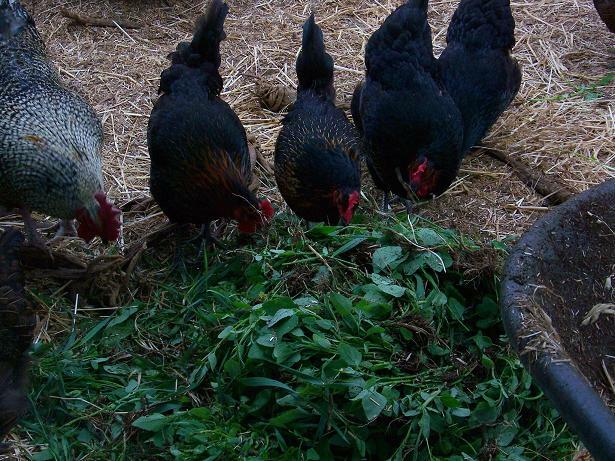 Besides the weeds, any leaves discarded from the salad beds can be fed to the chickens. 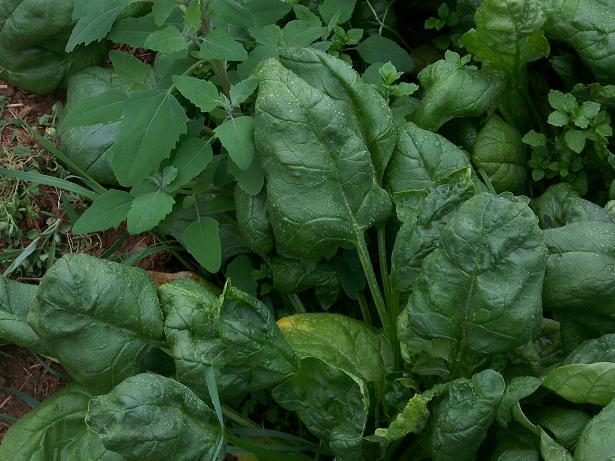 When you look at nutritional data comparing Lambsquarters to Spinach, the Lambsquarters are a much better source for Vitamin A, calcium, and other vitamins and minerals. Makes me think the chickens are eating better than we are. I add it to the harvest basket when it is handy, but maybe I should be including it more after doing that research. 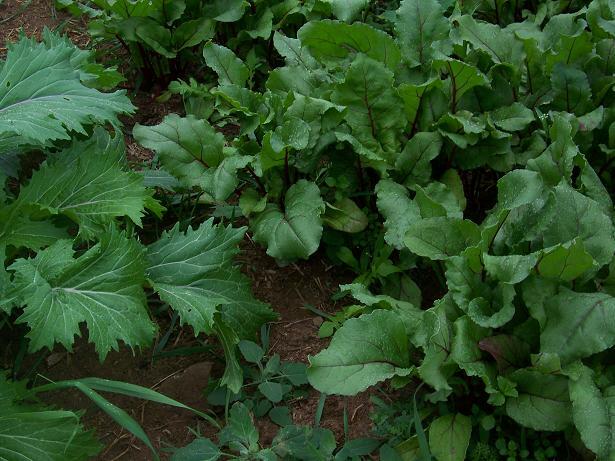 The beets need thinning too, so anything we don’t want to eat can go to the chickens. 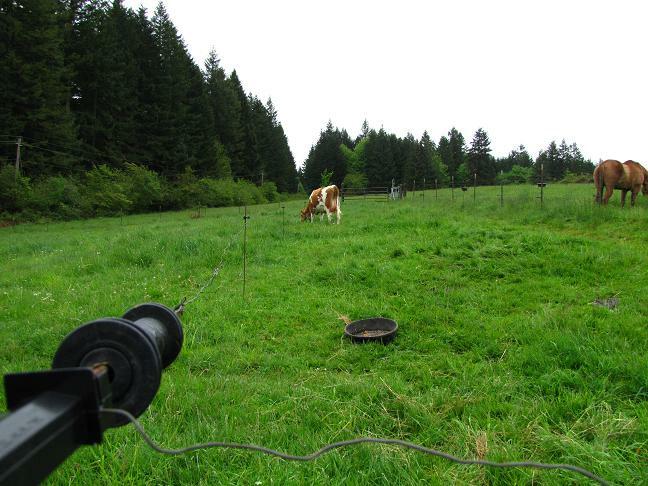 The final thread connecting all this is Jane grazing down the paddocks where the broiler pen will go. 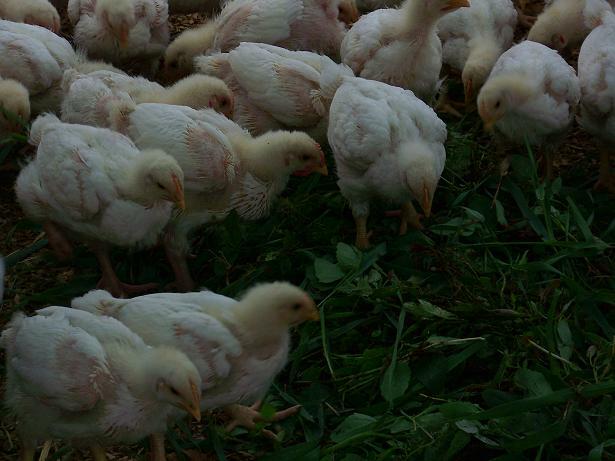 The grass needs to be short for the young broilers and I need Jane close so I can keep an eye on her. The chickens will fertilize the grass as they go and it will be ready for another round of grazing later. I consider myself an agrarian, not a free-range forager. 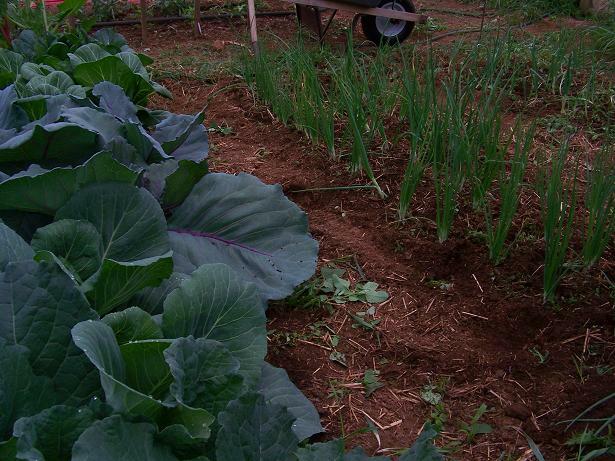 I try to carefully orchestrate what goes on, so I am not being wasteful or impacting the land in a harsh way. The “P” word that really sets people off, production, in fact is a good way of being frugal. Waste not, want not, should be the motto. Whether it is supplies, feed, time, or animals. There is nothing wrong with production and systems, there is something wrong with letting animals and plants free-range and you hope for the best or the minimum, I want the most for me and my land and animals efforts. Don’t you? Is that selfish? How can that be selfish? You take care of the land, the food and the animals…in return the land, the food and the animals take care of you. The trick is to not take more than you give and always leave the imbalance to the good of the land. A much more symbiotic relationship than a dandelion free yard and eggs and meat from the not so local ***mart. Thanks for your thoughts, I am learning a lot. Man, I like how you think. We are finally getting this whole relational thing figured out after 3 years of working, making mistakes and learning. Not one thing done on our land is isolated. Every single thing is in some way connected to something else. I thank you most sincerely for sharing your wisdom – we truly have learned so very much from your wise and experienced words. Sherri, thank you, and crazy is putting it mildly. I’m warding off edema as we speak and changed up her minerals a bit. She is starting to get annoyed at that big dangly thing between her legs. You can feed coffee grounds to chickens?! Joshua, sure it helps them wake up early 😉 Just kidding, I have no idea how much they eat, mostly just what gets stuck on egg shells and other stuff that makes its way into the compost container. No matter it all becomes part of the garden at some point. I must say I don’t know how you do it all! I only have 10 acres and 15 chickens and 2 med size gardens and I can’t keep up with you. Your blog is highly informative and I have spent many hours reading the archives. I am learning a lot of ‘tricks” from you. I just want to say THANKS! I don’t think it is selfish either. We are also developing that cycle after 3 years of watching what happens on our land. We are going to get alpacas for fleece but I was looking at the land where we are battling weeds and not good hay grass and coming to the conclusion that actually we could do with some sheep that will keep the grass very short and discourage the weeds, especially as they eat far more than alpacas do. That way we can improve the grassland for hay over a period of time, oh yes and fill our freezer with lamb on the way. 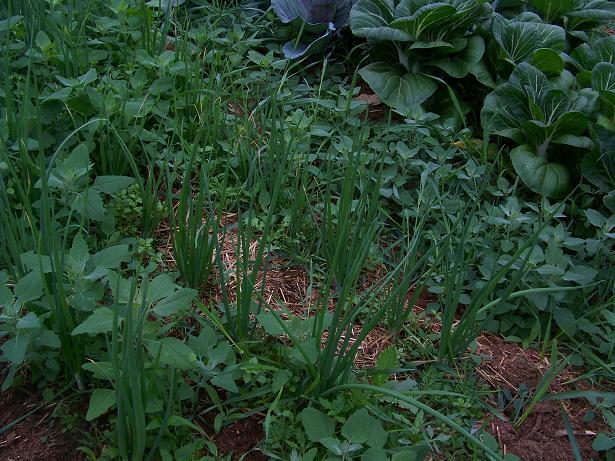 As for recycling the weeds using the chickens. I have been tipping turf cut from weedy paths onto an area where we will put the chickens on. This will help us to build up a raised bed which will be ready fertilised next year for a new strawberry bed. We will use an ark (chicken tractor?) to move them up and down the bed until they’ve done their stuff, adding compost, straw and whatever else we can think of to produce the bed. Our ark is also nicely greenhouse bed size, so that in the winter when they get moved in there, they will be put on each of the beds to fertilise those. One question I have, at what age do you feed greens to chicks? Some places say not to feed greens to chicks and so I am a little wary as this is the first time we have had chicks. Living on a 1/4 I try to incorporate that kind of symbiotic thinking into everything I do, as well. And also how to grow more things vertically, but that’s beside the point. Funny thing? The more I focus on the relationship between organisms, the less waste I produce! Like, actual trash leaving our property! It’s a great little side effect/unintended positive consequence! I didn’t know you could feed coffee grounds to chickens either, though I did know you can put them (and the filter) in the compost pile. Thanks for another very interesting update, Matron! We give our chickens everything that goes into the compost bucket in the kitchen. We figure if they like it, they’ll eat it; if not, they’ll scratch it around with the straw and their manure and compost it. We even throw the paper filter in, too. We’ve been doing it this way for at least 16 years without a single problem. I don’t have counter space for a chicken bucket AND a compost bucket along with my ferments and cultures and soaking beans… besides, we didn’t know better than to feed certain things in the beginning. When it didn’t hurt them, we just kept on doing it the same way as always. Like you this time of the year the “stuff” in the house suffers. I can’t even seem to get around to baking cookies. We broke records for heat here today 96* the last time it was this hot was in 1939. Heat and short of water….what a season! Your chickens apparently eat things mine won’t. Every day I lay my coffee filter out on the back deck (to which the chickens have access) to dry out. Once dry, I pour the grounds into my compost. The chickens have never tried to peck at the coffee grounds. And my backyard is a mass of lambsquarters that they never touch either. I pick it from time to time to add to our salads, so I’ve always been a little surprised the chickens don’t eat it. I think I originally found your blog through a discussion on free range vs managed grazing with chickens. On our farm, the birds are a tool we use to deliver disturbance at intervals. We desire to use all of our resources efficiently AND morally. We must not abandon our morality for additional efficiency. It strikes me that large houses of thousands of broilers are very efficient but probably immoral. Moving a chicken tractor daily to enhance the soil in a specific area (and keeping the fat, dumb birds near the water) is, in our opinion, an appropriate way to raise the breed. Even the dog has ranging limits. The children are pretty well free-range though…at least within the property lines.